Greetings one and most. Jim Thomas is in Boston, but I'm in St. Louis, so I get the honors of doing the chat today. Talk about good timing. This chat figures not to have the doom and gloom of other chats. If you haven't listened to this week's podcast, it may have been the most upbeat one we've recorded all season. We're a few minutes early, but seven people are logged in and there are some questions in the hopper. I've poured myself a soft drink, I've got an open bag of Tostitos. Let's go. Has anyone in the media been able to talk with Mike Yeo and get his thoughts on what happened? The last time Jim reached out to him, he said he wasn't ready to talk yet. Are the Blues buyers or sellers at the trade deadline? They're sellers, unless the Central Division does a full 180. Can't see where the Blues would trade away any prospects to make a run at this season, as much as they would like to make the playoffs. I think if you're about to be an unrestricted free agent, you should keep a bag packed. Tom, can you please explain the scenario again regarding the Blues first round draft pick going to Buffalo? If we finish out of the bottom 10 then we lose our first pick to Buffalo, is that how it works? If the Blues' pick becomes a top 10 pick this year, the Blues have the choice on whether to keep it or let Buffalo have it (and I think they have right up until draft day to make that choice). If they choose to keep it this year, then Buffalo gets next year's pick, no matter where it falls. If the Blues' pick is 11th or higher this season, then Buffalo gets it. Now that the Blues are apparently back in the playoff race, do you see the Blues being more or less aggressive with regards to trades? I think with them all of a sudden being back in the playoff race, they will be less aggressive, because making the playoffs is better for the bottom line. Which is not to say they won't make trades; potential UFAs have a strong chance of being moved. But a big shake-em-up trade seems less likely. Not too long ago, the thought of a playoff spot seemed remote. Now, it's not so remote. By the way, while we wait to get up to speed here, the Blues are having an optional skate today in Boston, so we might be getting updates on the health conditions of some players here during the chat. Jim is on the case in Boston. As someone who grew up in Southern California, it's a weird feeling right now. I spent the first 15 years of my life rooting for the Los Angeles Rams. Well, maybe not years 0 through 5. One hopes that Vince Dunn is taking the option skate and working on his 3-on-3 play (marring otherwise excellent play of late). Dunn is usually on hand for optional skates, though last night's events might be answered better with a film session than with on-ice work. Dunn ended up a plus-1 last night since he got off the ice before the OT goal was scored. Pietrangelo got the minus on that goal. Were the Blue's having a "Dad's trip" or something similar in Dallas? I saw a section of Blue jersey wearers in a suite and then I had a chance to say hi to Bobby Plager outside the arena and it looked like he was helping to get that same group on a bus. Just curious if that was a family group or something else. The Dad's trip this year is on the Florida trip. Can't say the team wasn't thinking on that one, and it works out well since the team two days off on the road between a game in Columbus and one in Sunrise, so they can squeeze a full, or mostly full, off day in there. The Dallas group was a season-ticket holder/fan group, I believe. I'm at a loss with how Fabbri is being deployed. Berube has him slotted on the 3rd or 4th line with limited limits, or a healthy scratch. Are the Blues still being careful with him? Seems to me he should be in a more prominent role...like in Sanford's spot with O'Reilly & Perron...he also had great chemistry with Tarasenko prior to his injuries. What's going on here? As with most things, it's a combination of things. They can get a more physical presence from Sanford on the O'Reilly line, they can ease Fabbri back though at the same time, his game isn't where it needs to be. Unless I've missed something, Fabbri hasn't been credited with any hits in his seven games since coming from his shoulder injury. You can't blame the guy considering how he hurt his shoulder, but it looks like he needs some time to work into his game. Anyone ask what Sunny did differently this offseason vs. the other years, because he is playing great hockey. Fast becoming one of my favorite guys to watch on the ice. I did, just the other day. 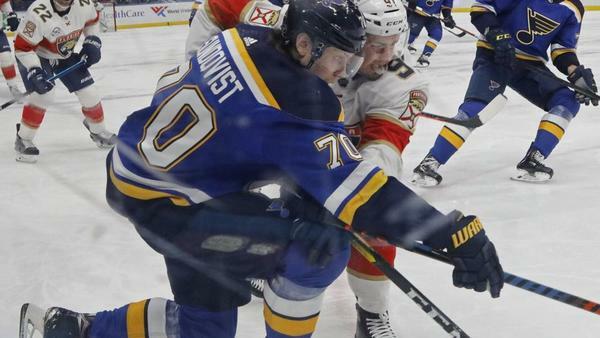 stltoday.comWhen the Blues’ 2017-18 season ended, forward Oskar Sundqvist sat down with coach Mike Yeo and general manager Doug Armstrong for the traditional end-of-season meeting. He's not on this road trip, so no updates on what he's doing. We'll see if he's on the ice when the team gets back on Friday (or Saturday, since they might take Friday off). The earliest he can come off IR is Saturday, but with three days between then and the long All-Star/off week break, we might not be seeing him until the other side. Doesn’t Kyrou deserve a look with ror and Perron? Sanford has 4 points in his last 24 games, it is worth a look for a few games. This is going to be a tough trade deadline.... The Blues are probably a fringe playoff team, but are probably not bad enough for a top 10 pick (unless they start playing like they did earlier in the season). This looks like the case. The team is playing more like was expected of them at the start of the season. And there figure to be enough teams below them that will definitely be unloading talent that the Blues are going to be longshots for a good draft pick. If you were to rate all their end-of-season possibilities right now, it's probably the scenario where don't make the playoffs and don't have a top 10 pick. Last week on Net Front Presence Gordo and Jim declared the note all but dead, and they ripped off three wins. Yesterday on the podcast you and Gordo expressed optimism over the outlook, and the note dropped a game. Is this evidence of the power of the sporting press? Hey, they got a point last night. I think Gordo and I did say that 3-2 would be the expected finish over their five pre-All-Star break games and anything above that would be good. Is Sanford our after the hit he received last night? I can’t tell if Parrayko is effectively the Blues top pair D anchor, or if the team in shifting more defensively just leans heavier on him versus Pietro. If they can run with both of them playing well and eating up a ton of minutes, then few teams have such strength. Halfway through the season have we seen Parrayko take “the next step”? Parayko has been rolling up the minutes lately (though last night, he played just under 18, one of his lowest totals of the season. He's been logging as much ice time or more than Pietrangelo in most games. And the first goal last night was the first one he had been on the ice by an opposing team in a long time. He's been playing very well. People tend to think of Parayko in terms of offense because of his shot, but he's doing a job defensively that has been excellent. Coaches have always valued his defensive game, his big reach and facility at getting the puck out of the defensive zone. He's doing a good job on both sides of the puck now. Sorry for the delay. Had to get lunch out of the oven. I haven't been able to watch the power play in much detail over the last week but have noted that Taresenko has been more effective. Have they moved him down low from the point that he had been playing? Nope. Still up top, at least at the start. He does move up and down. Seems like the passing has been better, finding open players, less keeping it on the perimeter. Would the Blue be better off long term to trade Schenn and Petro now when they have a year left on their contract than holding onto them until summer. The Blues probably are not going to be able to afford them when it's time to resign or would a player like Schwartz be traded to free up the cap space in order to extend one of those guys. The Blues will never get more for Schenn or Pietrangelo than they will right now. Make the move next year, they're a rental and you get a rental return. Make the move now and you can get a player or two in return. But the question is if the team feels they can get the right return for them, and if they don't, then trading them is a bad idea, especially Pietrangelo, who would be very hard to replace because of the many things he does. The salary cap should go up next season, and some contracts come off the books to free up some space, so they will have some room to maneuver. Can the Blues technically assign Steen and Bozak to San Antonio (if they clear waivers)? It seems to be a good option that would help young players to have more ice time and develop. What do you mean by technically? Yes, they could put them on waivers to try to send them to San Antonio -- both have no trade clauses, but not no-movement clauses -- but that doesn't seem like very good asset management and I don't know that it makes this year's team more likely to win, which is what it seems they're trying to do right now. Will the Blues need to protect Kyrou and Thomas from Seattle in three years (given that they have played some games with them already, and it was more than 11 games)? If yes, then why would they need to protect Kostin if he gets called up and plays 11 games? What's the difference there - if any? As far as I can tell, yes, they'll have to protect them. The rule last time around, which I think will be the rule next time around, is you're exempt with two or less professional seasons, and it doesn't matter the level. And this is Kostin's second season.